The monkey is finally off the back of Matt Ryan and the Atlanta Falcons, after a thrilling 30-28 victory over the Seattle Seahawks. Trailing 27-7, Russell Wilson led the Seahawks rally, putting them up 28-27 with 34 seconds renaming. Two Matt Ryan completions later the Falcons were in field goal position. Matt Bryant would nail a game winning field goal with 13 seconds left. 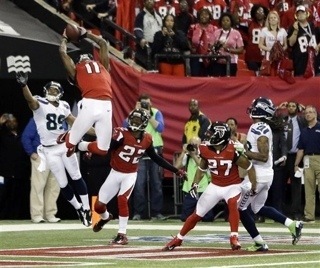 Russell Wilson’s Hail Mary attempt was intercepted in the endzone by Julio Jones as time expired. 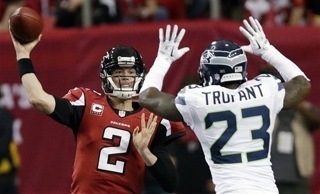 Matt Ryan passed for 250 yards, 3 touchdowns, and 2 interceptions. 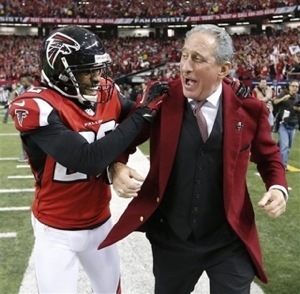 Roddy White had 5 catches for 76 yards and a touchdown. Russell Wilson had another great effort with 385 passing yards, 2 touchdowns and an interception. Wilson also rushed for 60 yards and another touchdown. Zach Miller totaled 142 receiving yards and a touchdown. The Falcons will host the San Francisco 49ers in the NFC Championship game next Sunday.